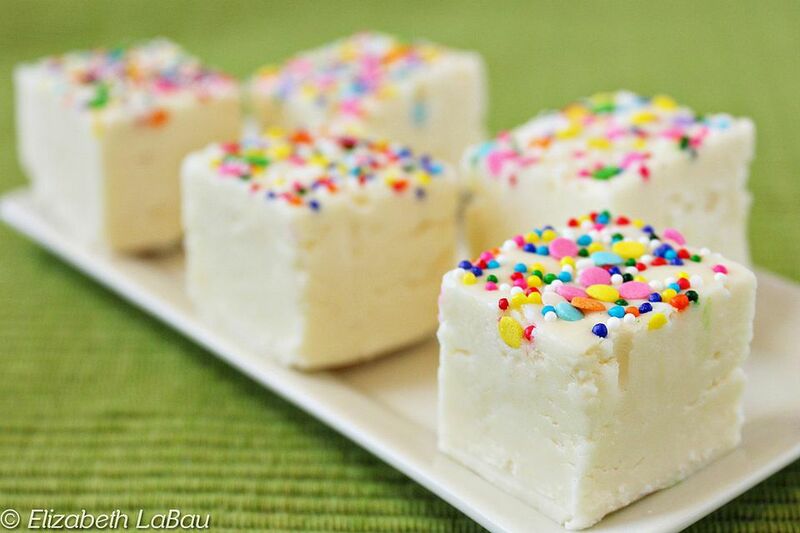 Cake Batter Fudge is a smooth, creamy fudge with the unmistakable flavor of cake batter! This fudge looks innocent, but one taste will bring you back to the days of licking cake batter off beaters. Top this fudge with a scattering of sprinkles to complete the resemblance. Prepare an 8x8 or 9x9 pan by lining it with aluminum foil and spraying the foil with nonstick cooking spray. Place the butter, sour cream, salt, and sugar in a heavy-bottomed medium saucepan over medium-high heat. Stir until the sugar and butter melt. Continue to cook the fudge, stirring frequently, until it comes to a full boil. Once boiling, cook it for five minutes, stirring constantly to prevent scorching. If you are using a candy thermometer instead of timing it, it should be at 235 degrees. After five minutes, remove the pan from the heat and add the white chocolate chips and the marshmallow cream. Stir vigorously until the chips and cream are melted and incorporated. If necessary, return the fudge to the heat for brief periods to melt the chips. Add the vanilla and the dry cake mix and stir well. You can even use a whisk to make sure that any small clumps of cake mix are completely mixed in. Taste the fudge, and if desired, add another spoonful or two of cake mix until the flavor is as strong as you'd like. Pour the fudge into the prepared pan and smooth it into an even layer. Scatter the sprinkles all over the top and press gently so that they adhere to the fudge. Allow it to set at room temperature for 3-4 hours, or in the refrigerator for 1-2 hours. To serve, cut it into small 1-inch pieces. Store Cake Batter Fudge in an airtight container at room temperature for up to one week or in the refrigerator for up to two weeks.